The obvious embayment in the cliff line. The left side of the steep slab. Start left of the belay chain and climb up the wall past 2 bolts. Excellent climbing on small incuts up the slab, moving right to the top. Seven bolts and anchors. 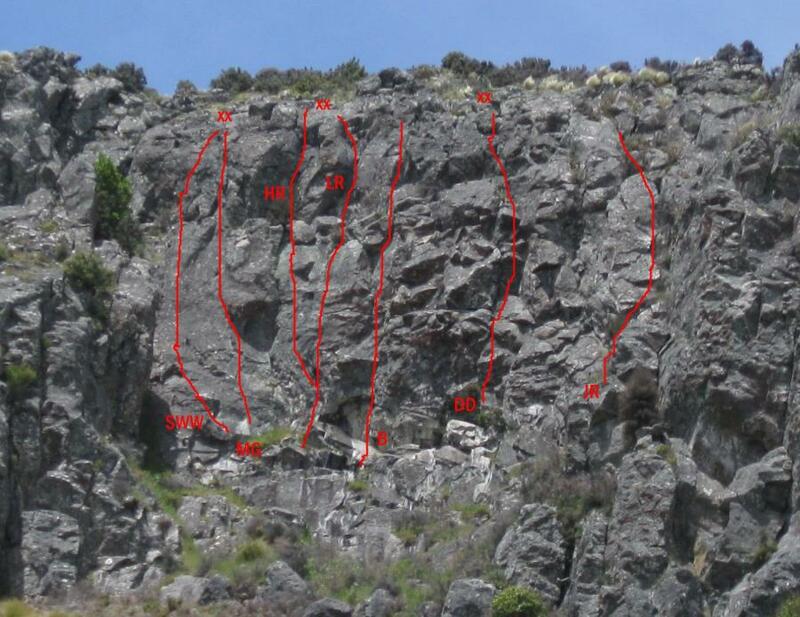 From the same belay bolt, start a metre right and follow a line of 8 bolts parallel to the previous climb. In the centre follow the faint crack. Shares anchors for previous route. Starts at the next belay chain about 5m right. From the ledge above the first bolt gain the corner on the left; move right on to the face at the third bolt and pull up (crux) to easier ground and pleasant climbing to the top. 7 bolts & anchors. Climb The High Road to the second bolt, then move right over a flake to the corner; move left and climb the face and rib to a ledge. Finish to the left up the obvious corner. 8 bolts; shares anchors with the previous route. Start up the white face into the right facing dihedral. Move right at the capping stone in the dihedral. Continue up through the slightly overhanging block to finish. On natural pro but 2 bolts on adjacent route can be clipped. A trad route tracking steadily about 1-2 metres left of Devil’s Delight. Start up a steep crack and move left to a thought-provoking bulge. Surmount this to meet a steep corner and crack with good gear, followed by a small bulge and short crack to the DD anchor. Technical but reasonably well-protected. The furthest right bolted route in The Embayment, 10 metres right of The Low Road. Start up the the rib and face past 3 bolts. Continue up steep ground past small rooflets in a groove, and top out over a couple of large ledges. 9 bolts & ring anchors. Gabriel Lincourt, FFA Daniel Sutherland, 2006. Follows a vague crack and groove immediately left of Customline. From a huge jug climb the crack and bridge up the groove past the bolt to big holds. Easy to the top – anchor rings just left. Good spaced gear, including micro-cams. On the right of the bay is an obvious crack. Start slightly right, or directly below and move right, to reach a left-leading ramp, with a move across left to gain the base of the crack. Then up the crack with big gear, and wander leftward, with a small move over a bulge to gain the top. Ring anchors. The line marked for Customline seems to be too far right by one corner. The start to Devils Delight should be lower and to the right as well.